Daily at 2pm – Hands-On Solstice Demos with Mersive CTO, Christopher Jaynes. Come try Solstice for yourself and learn how Solstice transforms meetings with Mersive CTO and creator of Solstice, Christopher Jaynes. 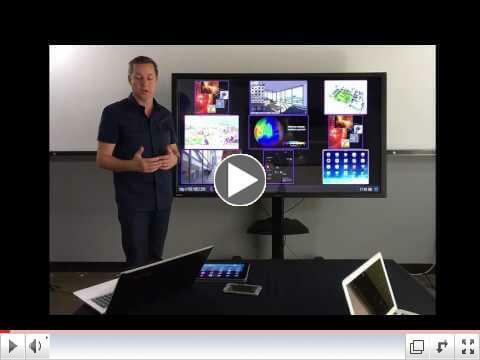 June 8 at 1pm – An Integrator’s View of Content-Based Collaboration Solutions. To provide a channel view of the content-based collaboration product category, Chris Johnson, CTO of top AV integrator Technical Innovation, will join us and offer an integrator’s perspective. June 9 at 10:30am – The Wharton School’s Use-Case Briefing. Mersive is pleased to host special guest David Siedell, Senior Director of Learning Technology at the Wharton School of the University of Pennsylvania, to discuss the deployment and role of content-based collaboration in the higher education setting. June 8-9 at 8am – Mersive Partner Breakfast Clinics. Mersive partners are invited to a Solstice refresher training session. A complimentary breakfast will be included, and space is limited so please sign up now! Mersive is pleased to announce the launch of a Solstice training program for customers and partners. Mersive will host two webinar trainings each month, one for IT/technology managers and a second for Mersive partners, covering the product fundamentals for each audience and answering questions. The first training webinars will take place June 22nd for partners and June 29th for IT/technology managers, and future trainings will become available each month. To find the next available training webinars and signup, visit Mersive events page. If you are not able to attend the monthly webinars, we’re also producing a video training series on our YouTube channel. You can view the first, end-user training video below, and follow us on YouTube for the next network and management videos coming soon!